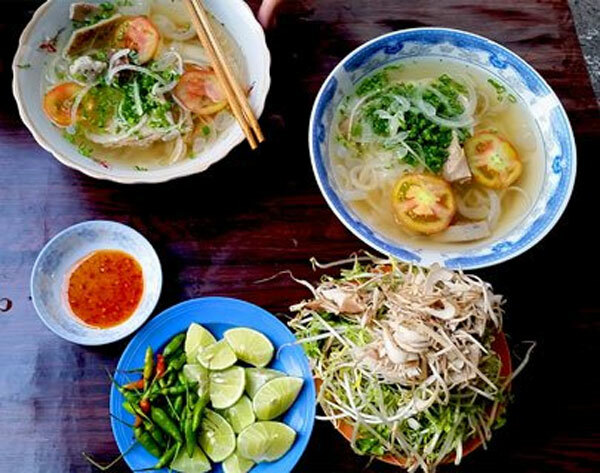 Some tourists say a trip to Nha Trang, a resort city on the central coast, will not be complete without having a bowl of bun ca sua, a type of rice vermicelli soup served with fried fish paste and jelly fish. This is one of the most popular delights among Nha Trang residents. A bowl of rice vermicelli with fried and steamed fish paste and jelly fish costs VND20,000-25,000. The fish chosen for making fish paste and broth must be fresh. And people usually make them from paradise fish or leatherjacket fish. The broth is made from fish bones, so it is an essential element that makes the taste of the dish special. Traditionally, rice vermicelli used for bun ca sua sticks together into small round pieces and each fibre of the rice noodle will be separated when put into the boiling broth, allowing diners to feel their softness. The jelly fish have a crunchy and crispy texture. Bun ca Ninh Hoa eatery, just in front of Lan Ong Alley across Dam Market in the city’s center, is one of the most famous places for those wishing to have a bowl of Nha Trang-style bun ca sua early in the morning. For breakfast, guests should come to the restaurant before it is close at 9 a.m.